By the time Phil Graves, a USA Archery Level 4, Coach, trainer and judge, wrapped up a 10 day visit to the territory last week, Virgin Islands Archery Association officials had been granted more assistance than they had hoped for. Graves said that he was assisting the association with their recovery and lending some of his background and experience in areas including the reconstruction of the support components and the available assets in the territory. While he was shocked, Graves said he was pleased to see how people have recovered which has been heartwarming and gratifying to see people going on with their lives, recovering and getting a back to normalcy. Graves said when the archers have been shooting and draw attention to people walking in front targets, there has been no confrontation as people go around or have stood and watched what’s going on. 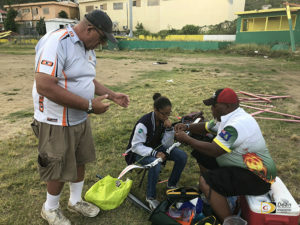 Following Hurricane Irma, Graves said there has been damage to archery equipment and he has been working with the association, and has been restored to pre storm levels. Graves met with BVI Olympic Committee officials who asked about the association’s needs. He said a pressing need is having a facility where the archers can practice safely, be able to set up an archery range even if its shared facility. He said they need to be able to shoot up to 70 meters. He said a collegiate program will also be constructed. Graves added that a sustainable program has been put in place from middle school, high school through the collegiate level. If one starts shooting at a young age, they can continue through their college years.